Patchwork is a fantastic way to recycle small pieces of cotton fabric by sewing them together to make beautiful patchwork bedspreads, cushion covers, throws, blankets and quilts. We know that it can be a bit tricky to select the right patches of material so we hope that the below patchwork designs will give you plenty of ideas to make your own patchwork patterns. This selection includes lovely patchwork quilts for children and babies, stylish patchwork heart cushion covers, vintage shabby chic patchwork bedspreads and many more! If you would like to buy one of these patchwork patterns, you can click on the image or on the more info button to buy them. 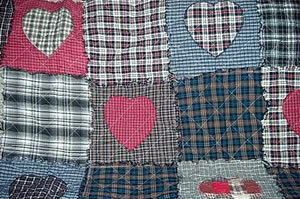 Looking for cotton fabric for your patchwork? Our cotton fabric section includes lovely floral fabric and children vintage cotton fabric that would be perfect for patchwork projects.